Many people believe that residential segregation in America is caused by “de facto segregation” (a separation of groups occurring from natural conditions or preferences), instead of resulting from “de jure” segregation (segregation by law). But, in Professor Richard Rothstein’s new book The Color of Law: A Forgotten History of How Our Government Segregated America, he offers up solid evidence proving that this belief is a myth. “Without government requirements, rules and regulations, we would not have been able to create the segregated landscape that we have today,” said Rothstein. 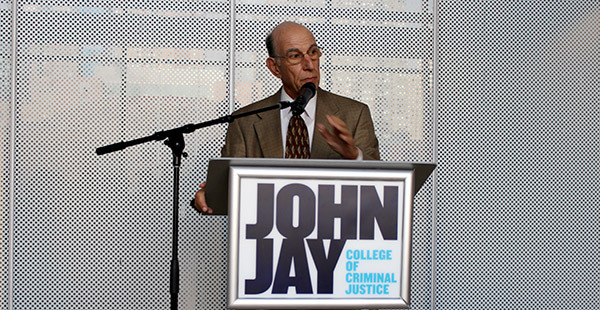 On September 6th, during his Office for the Advancement of Research (OAR) Book Talk, Rothstein made sure that the audience at John Jay College knew both the history and facts behind how our federal, state, and local governments explicitly segregated our country. Further describing the public housing programs role in residential segregation, Rothstein noted that in 1949, the government offered white families the opportunity to leave the housing projects, an opportunity black families were left out of, as explicitly stated in the contracts. “The Federal Housing Administration (FHA), subsidized the movement of white families out of the projects and into single family homes in suburbs such as Levittown, PA” said Rothstein. “No homes were sold to African Americans, and there were clauses prohibiting the resale to black families.” Rothstein said that projects like Levittown, funded with government money, were created all across America, developing suburban neighborhoods African Americans were unequivocally blocked from joining. Over time, this not only meant a loss of jobs in the cities because industries moved near those developments, it also meant a loss of generational wealth from being a home owner. And, in most cases, the federally sponsored mortgages cost less then the rent African Americans were already paying. To see Rothstein’s complete Book Talk, click here.